you just purchased a new property or you have never had a food plot for wildlife on your existing property or lease. There are many different ways to handle it. One is to check with a local farmer to see if he can work up an area for you and possibly plant it in corn or soybeans. This method is very common. Eventually the food plot evolves into a more diversified mixture of plants consisting of a good turnip mix, clovers, or alfalfa and still some corn and soybeans. I have had clients say they don’t want soybeans because there is a 40-acre field of them right next to their food plot. I try to reason with them that the food plot is located in a more comfortable place for the deer than the large field. 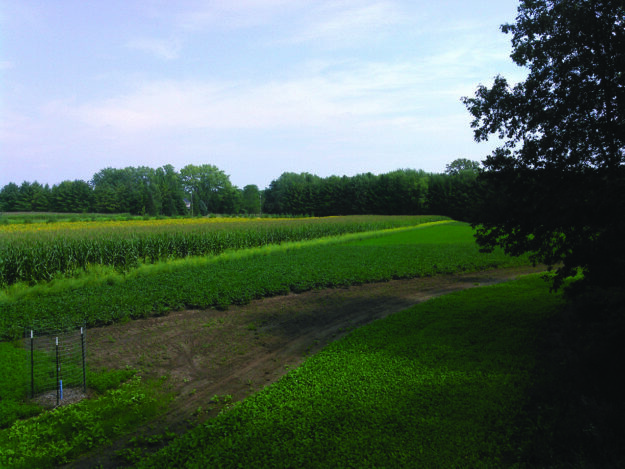 Plus the farmer will harvest his beans in October, leaving a bare field while the soybeans in your food plot will be the only ones around making it a very desirable location for deer to eat in prime archery season. Some of you might agree that it would be nice to grow soybeans in your area, but the deer never let the plant grow over 6 inches. If the deer density is that high, you may have to use a deer repellent for the summer, plant a less desirable crop or one they have a hard time destroying such as clover, alfalfa, wheat or rye. A lot of deer damage is a good thing. Some of the guys I deal with up in northern Wisconsin have little or no deer visiting their once very productive food plots. I cannot help them. It’s like feeding floating fish pellets in a farm pond that has been cleaned out by otter. You just keep hoping a fish will come up and eat…. I have recently been asked to help a local landowner with his food plot. Greg Gill Sr., from Appleton, had purchased a 50-pound bag of clover seed and wanted to know if I could help him plant it. I said I would help, but planting seven acres in one type of plant would be one-dimensional. Diversity in a food plot is always better with various plants being desired at different times of the year. One example I like to use is when you go out to eat in a nice restaurant and you go up to the salad bar, you expect a variety to choose or graze from. If the salad bar was all carrots or olives, you wouldn’t spend much time there or go back anytime soon. Well if it was chocolate cake or chocolate ice cream, we might be able to work something out. I did stumble on a method to attract deer to make almost any crop more palatable, but that will be in a future article. to get back on track, instead of planting seven acres in clover, Greg said, “Okay, if this was your field, what would you do?” I sketched out a plan, including a variety of plants, a hedgerow of trees, and numerous fruit trees scattered throughout the field. He liked the plan and we got started last June. I expected this to be a 3 to 5 year plan, but to my surprise, it was a one-year makeover. We turned a bare field into a wildlife paradise in one summer. The crops that were planted consisted of two acres of a nice variety of sunflowers, two acres of different maturity dated corn, one acre of soybeans, one acre of alfalfa, and one acre of a good turnip mix with various strips of canola, wheat, rye, radishes, and a tall mix for the borders. 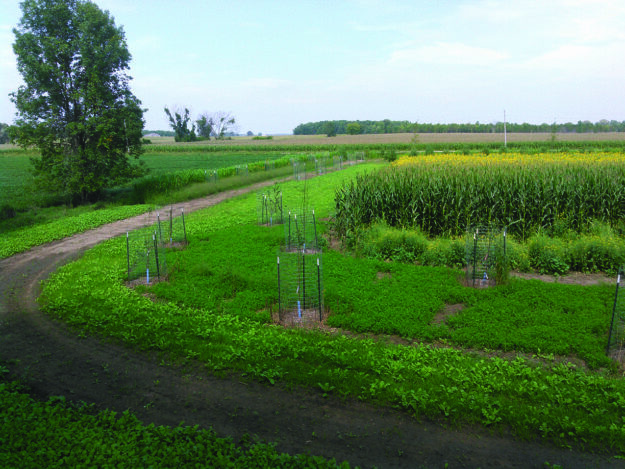 The tall mix consisted of corn, sunflowers, sedan grass, sorghum, and English wheat. We decided on a variety of trees. The fruit trees were 5 to 7 feet tall and consisted of several different apples (Haralred, Red Baron, Red Delicious, Honeygold, and Macoun), pears (Bartlett and Summercrisp), and plums (Black Ice, Pipestone, and Superior). All of the fruit trees were wrapped and fenced in to protect them from the mice and deer. The white pines for the border were 7 to 9 feet tall, and the red oak trees were approximately 15 feet tall. All of the trees were planted by the crew of Wolfrath’s Nursery out of Hortonville and they have a 100% guarantee. Chad Wolfrath took my plan and helped me with the design of the property and gave us a full color visual of the entire project using Google Earth. When looking at the design, Greg and I discussed how nice it would be to have a walking trail go around the whole project. Because of the heavy clay, we added wood chips to the entire trail so that Greg and his wife could walk the trail even after a heavy downpour. The amount of wildlife this field attracted was amazing and it will only get better with the offspring of the animals that are using it now. A good plan with good diversity will attract wildlife in almost any area. You may have to start small and add to your plan each year until you achieve your goal. Have a great planting season and think variety and diversity when planting food plots. Be sure to check out the premier hunting and fishing magazine to read more about hunting and fishing tactics, as well as see more hunting articles on MorningMoss.